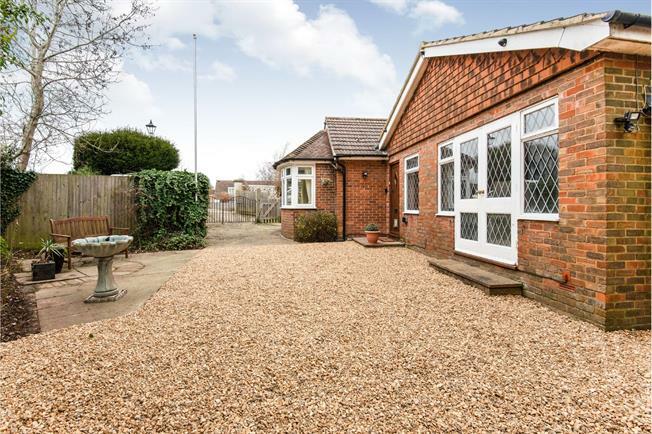 2 Bedroom Detached Bungalow For Sale in Wadhurst for Asking Price £345,000. This spacious detached bungalow offers light and flexible accommodation to meet a variety of needs. Recently refurbished throughout and presented to a high standard, this property is suitable for a variety of potential buyers and can be adapted to suit a range of requirements. The accommodation comprises of a spacious entrance hall that could work as a study space, a sitting room with French doors leading to a seating area, a modern fitted kitchen, a family bathroom and two large bright double bedrooms. There is a single attached garage and a garden room which could easily be converted to increase the living space or be used to create a third bedroom. Externally there is off road parking for several cars, a well kept garden offering a good amount of privacy and patio areas ideal for enjoying long evenings in the summer months. Available with no onward chain, this property is a great home you could move straight in to, with the added benefit of further potential to extend and develop more space if required. Viewing highly recommended!